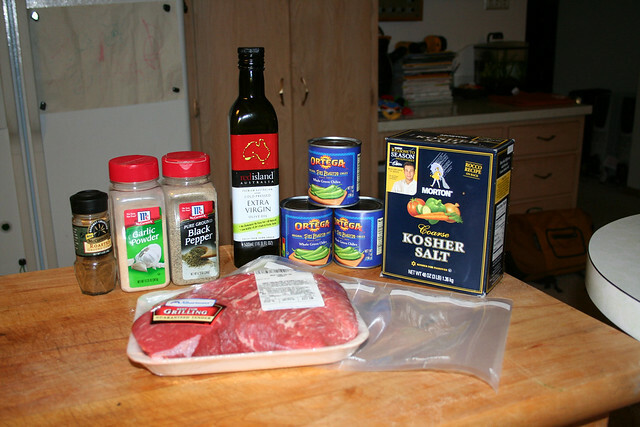 The Rogue Gourmet :: Carne Asada Tacos Cooked Sous Vide Part 1. Carne Asada Tacos Cooked Sous Vide Part 1. Once a week is steak night at our house. Both my wife and I realy enjoy tri-tip and flank, both of which are a bit toothier than some more expensive cuts, but both offer great flavor, marinate well, and when cooked properly are a fantastic value. One of my favorite ways to cook both of these cuts is Sous Vide. Cooking using this method is nothing new to the foodie community, and last year the introduction of the SousVide Supreme made affordable sous vide cooking available to the home cook. I was happy to be an early adopter of this gadget, and honestly after using it for over a year now, I am a really big fan. Sous Vide cooking - for all the hype does one thing better than any other cooking method, cooking proteins. Being able to dial the temperature of a cut of meat to the degree, and lock it in to that temp for whatever period of time you want is fantastic. Beyond fantastic really. Beef and duck are my favorites, but almost any animal protein can be cooked to absolute perfection in one of these cookers. An additional advantage offered by cooking sous vide (under vacuum in French) is the unusual infusion of flavor you can achive. 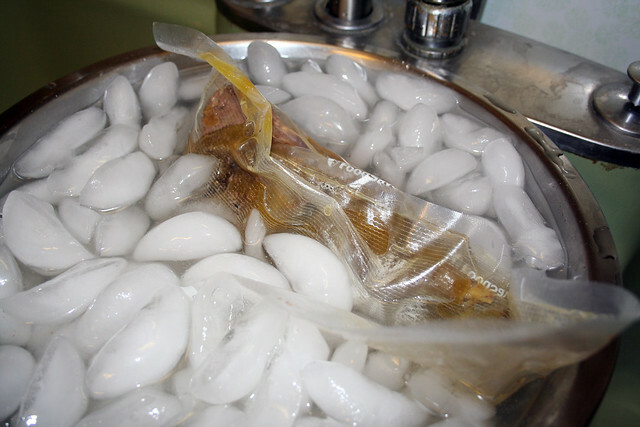 Ultimately sous vide cooking is a very regulated type of poaching, but cooking in a bag lets you "poach" in a variety of ingredients that are near impossible to replicate with traditional kitchen equipment. Sous vide cooking also requires far less liquid be added to the bag - so suddenly you can poach salmon... in toasted sesame oil, affordably. I keep a silicone ice cube tray in the freezer with cubes of really good olive, and sesame oil. I pop out a cube, and I have enough oil to add a dramatic splash of flavor to any dish. 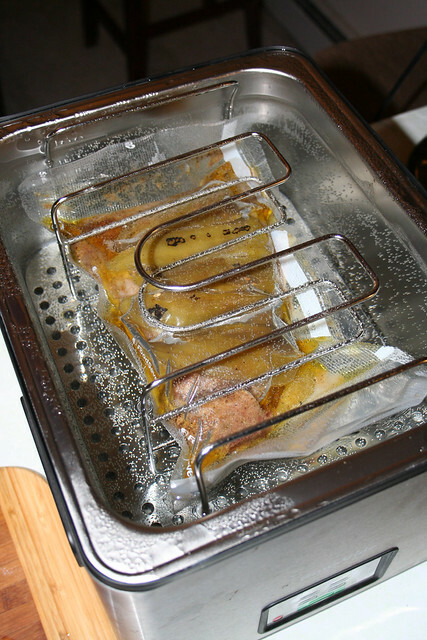 I add the cube to the bag with my ingredients, vacuum and seal the bag, and drop it in the water-bath, the oil melts and is pulled around the meat by the vacuum on the bag. When you remove your meat from the bag, just dry the meat well before browning, and the rich flavor of the oil is infused into the meat - but without the oiliness. It's brilliant. 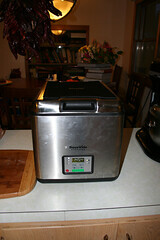 I have been wanting to try doing a carne asada in the SousVide Supreme for a long time. Starting tonight, I am trying it for the first time. Its going to be an overnight recipe. I spiced a Tri-Tip with roasted cumin, garlic powder, salt and pepper, and wrapped the roast in canned Hatch New Mexico chiles (I am out of frozen chiles). I added an olive oil cube, vacummed the bag and cooked it in the water-bath tonight for 3 hours at 145 degs F./62.5 deg C.
After the three hours passed, I chilled it quickly in an ice bath, and put it in the fridge overnight to rest (and marinate in the cooking liquids). Tomorrow I will post part 2 of the process, and let you know about the results.